Weaving buddies of mine were recently at the Santa Fe International Folk Art Market and shared pictures and video of all the wonderful people, crafts and textiles they saw. Marge Sume was in the right place at the right time and shared a small piece of video that she took of a gentleman from Kyrgyzstan weaving a narrow band. It was very interesting to see this as I have woven replicas of patterns of Kygyzstan woven in the terme structure and I wrote a tutorial on the method that I use to create the structure. It is always wonderful to be able to see the methods the weavers themselves use but this is not always possible. And so, 6 years after I wove my first Kyrgyz motif, I now have been able to watch one of the weavers at work via Marge’s video clip. Exciting! It turns out that although my loom is different, the method is similar. The gentleman from Kyrgyzstan uses fewer steps than I do and is more efficient. You can see the loom on which the weaver is demonstrating and you will see more of it in the video. I, of course, use a backstrap loom for all my weaving. When I am using a backstrap loom, I feel that I am part of the loom myself. The warp is attached to my body by way of the backstrap. My movements back and forth allow me to relax and increase tension on the warp and operate the loom smoothly and efficiently. I am part of the loom. In fact, on the occasions when I stretch the warp between my hips and my big toe, I am more than just a part of the loom; I am the loom. My body movements enable me to easily open the shed controlled by the string heddles. A few coordinated moves which involve adjusting the tension on the warp allow me to raise the heddle stick and create a clean shed without having to struggle or scrape the heddles along the warp. All of you who have tried backstrap weaving will know what happens if you repeatedly scrape those heddles…fluff builds up, then pills and warp threads start to stick together making it very difficult to create clean sheds. So, what happens when you are working with a warp that is under a fixed tension? Your body is not part of the loom and you can’t increase or ease tension at will. Mariana is pulling the heddle rod with one hand in order to create a shed of all the white warp threads. Her other hand holds back the blue threads that want to stick and come forward with their white partners. The vertical loom is lashed to the floor and ceiling beams of the house and Mariana can put all her strength into pulling on the heddle rod without disturbing the loom. But, what if the loom is not fixed in place like Mariana’s and, what’s more, is made of very light-weight material? Marta, a Mapuche weaver of central Chile, is using a warp that is under fixed tension and her leaning vertical loom is very light. If she were to pull on her heddle rod, she would simply pull her loom away from the wall. She uses a different system for raising the warp threads that are controlled by the string heddles. The heddle stick rests against poles which are placed alongside the leaning posts of the loom frame which means that the warps in the heddles are in a raised position. This means that Marta does not have to pull on the heddle stick in order to raise the warps in the heddle shed. You can see in the following video at the 28-second mark that by pushing down on the warps held on the shed rod, just enough space is created to allow her to get her fingers under the warps in the heddles and lift to fully raise them. (You might want to turn down the volume for this video). Which brings me to the weaver from Kyrgyzstan. His heddles are in a position that keeps them in what looks like a permanently raised position. You will see that, like Marta, he does not need to touch the heddle stick at all in order to open that shed. 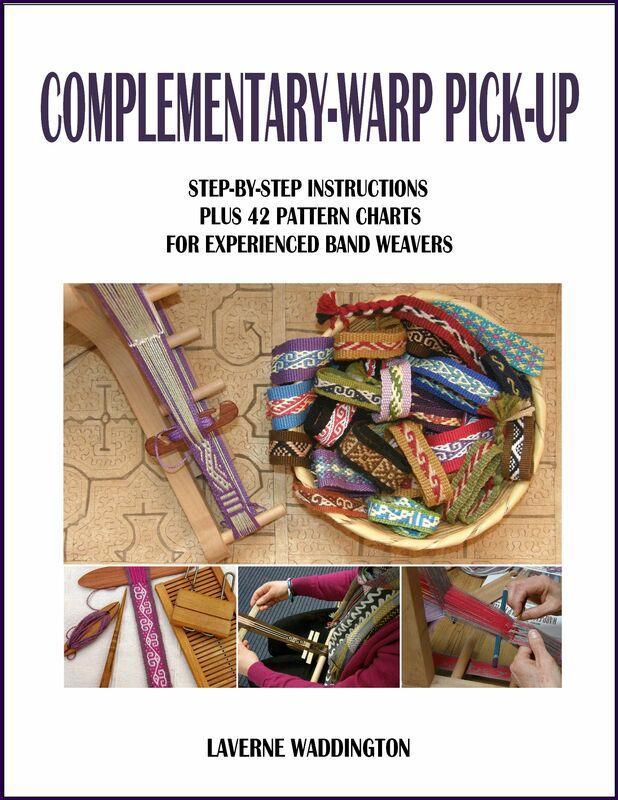 He simply strums the warps to bring all the light-colored warps to the upper layer. He props the wide flat piece of board on its side to raise the dark threads. 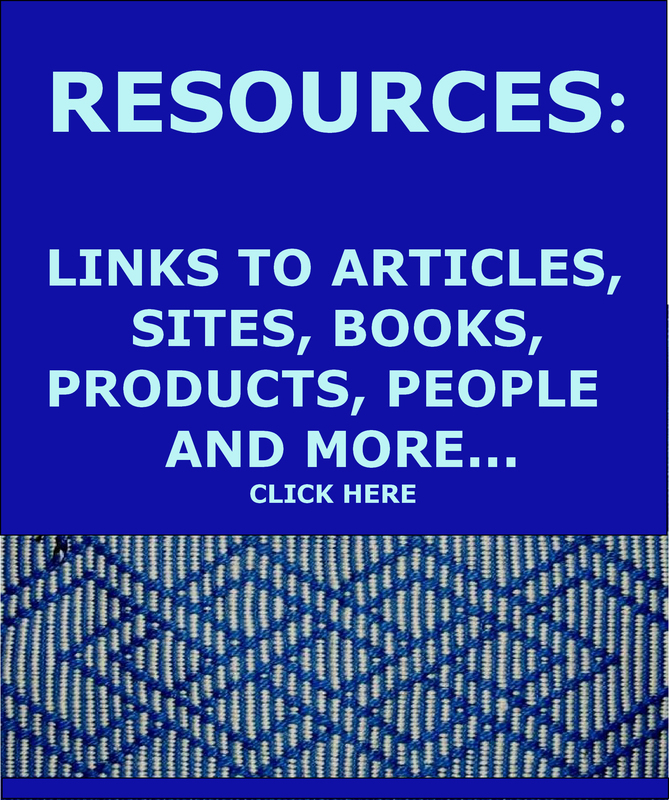 Many thanks to Marge for allowing me to share her video here. The weaver uses what I call a ”simple” warp-float technique because warp floats are used on only one face of the cloth. It is based on two sheds with dark threads in one shed and all the light threads in the other. Plain weave on such a warp would produce a band of alternating dark and light horizontal bars. You can see him selecting pairs of light colored warps and then adding them to the dark shed. Then he selects dark-colored pairs of warps and adds them to the light shed. One of my other weaving buddies, Annie, took pictures of the woven band. The motif is not clear at all in the video but in the pictures I could see that he was weaving an ”S” shaped motif. I was pretty tickled about that as it just happens to be the motif that I use in my tutorial here on my blog. The patterns are formed by floating certain pairs of dark threads over light horizontal bars and certain pairs of light threads over dark horizontal bars. 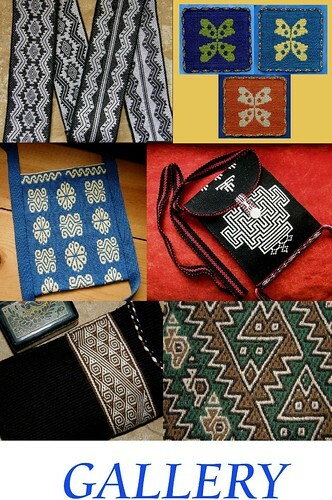 I have woven some of my favorite pieces using this technique and motifs from Kyrgyzstan but I have also seen cloth woven using this structure in tropical lowland Peru, Mexico and the Middle East. Now, let me show you some things I have been working on lately. I have been continuing to use the tiny skeins of naturally-dyed silk that I was given. Since I last posted, I have finished the piece using the blue and green tones and created a fourth piece using browns, tans and golds. I wanted to maintain the ”leaf” theme and wove a pattern of leaves and creeper into the blue and green piece and I invented my own leaf pattern in the Andean Pebble Weave structure for the brown piece. I have yet to glue and finish the book covers. I need to buy some nice paper in colors that match the fabric I have woven. I glue this paper on top of the ends of the woven fabric that get turned over to the inside of the covers. You can see an example below on the last collection of covered journals I made. Here are the three pieces I have made so far. The fabric is just sitting around the books for now until I am ready to glue and finish them. As for the fourth piece with the brown tones, I first needed to weave a sample as I had to see how the silk would behave and what kind of width it would give me in the Andean Pebble Weave structure. The first three pieces I had a woven with the silk were in plain weave…two simple versions with supplementary-weft patterns and one more complex one in double weave. I also wanted to see how my invented leaf pattern would look in case I needed to make adjustments. What looks good on paper often doesn’t weave up with the same happy results. I was pleased with my new pattern. The light colored silk is finer than the darker colors and I wasn’t sure if the pattern would show up well enough as a result. It’s quite a narrow pattern and so I decided to weave two columns of it in my project using the browns, tans and golds from my collection of naturally dyed silk. Now I can finish the red sample and sew it into a wrist cuff…another one for the collection. I have to admit that this new warp looked a little drab after the rich reds, purples and greens with which I had been working. 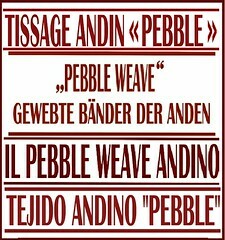 However, once the light Andean Pebble Weave pattern started showing up against the darker tones, the contrast brought the whole thing to life. As usual, it is hard to decide which side I like better. I had planned to use the darker side on the book cover and that is why I used light colors immediately next to the pebble weave section to provide a nice contrast. The back looks nice in its own way because the thicker dark-colored silk makes the leaves stand out more against the lighter finer silk background. Here are the four finished pieces waiting to be turned into book covers. I haven’t washed and pressed the brown piece yet. I still have plenty of silk left! There are lots of the deep rich red tones to play with and I might make something using only the finer of the two kinds of silk. The finer silk took the dye colors in a very different way and there are some very pretty apricot, melon, lavender and peach tones.Perhaps I will make some cuffs. What size are the journals you are covering? I’ve always admired them. What a great gift idea. Your post really is as wonderful as you always post! Thank you very much! Laverne the book covers are stunning!! I’m so looking forward to seeing you in September! Once again, Laverne. Your posts are so inspiring. 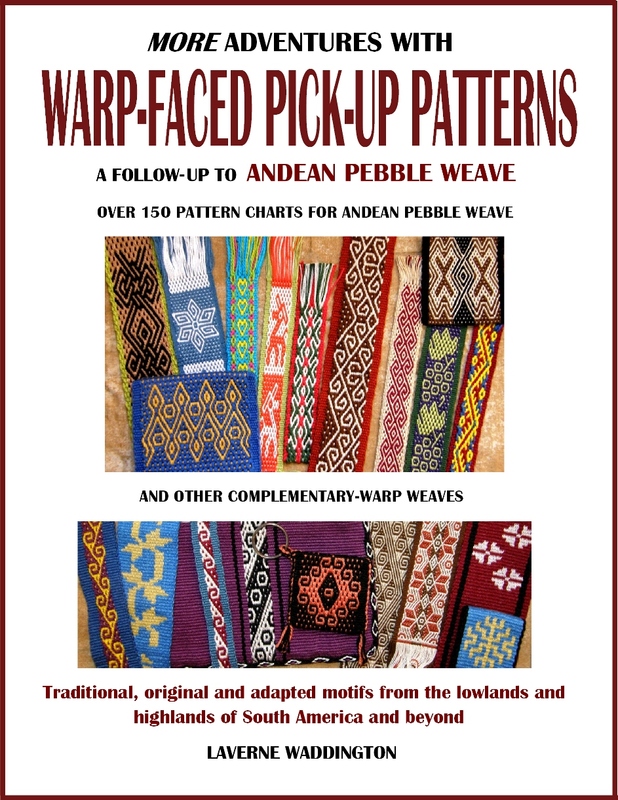 Beautiful weavings! Beautiful, just beautiful, such detail and richness.